In the early morning of 19 April 2013 in Watertown, Massachusetts, the home of Mike Mandel (1950) and Chantal Zakari (1968), the governor ordered residents to “shelter-in-place,” in other words, to stay inside their homes. Surrounding cities and towns were also called on to do so as a manhunt for Boston Marathon bomber, Dzhokhar Tsarnaev, was initiated. The vast military style manhunt was soon underway – one of the largest in the history of the United States. 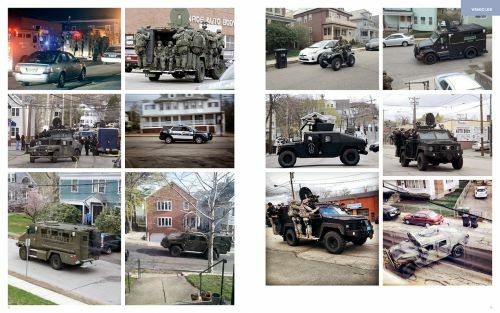 A twenty-block area of Watertown was cordoned off by thousands of police, and numerous SWAT teams were ordered to search every home in this target area. For 18 hours, residents stayed indoors, watching out from their windows, as tanks and heavily armed soldiers went door to door, searching in yards, under porches and, at times, inside homes. The search failed and the “shelter-in-place” order was lifted. 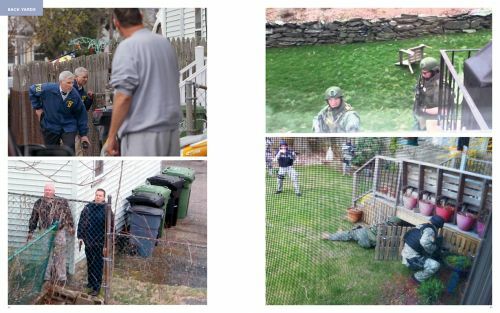 However, Tsarnaev was found one and a half hours later by a resident of the lockdown area. He had been hiding in the resident’s backyard under a cover over his boat. “Lockdown Archive” is a collection of images, all found on the web and reorganized chronologically by category and by location, in order to provide an encyclopedic overview of the manhunt.